I recently listened to a lecture ‘The importance of place’ from a Great Courses series on Cultural and Human Geography. The professor discussed the process of ‘place-making’ that occurs when humans interact with, and modify a physical space to make it their own. The result is a distinctive place with a unique culture shaped by the people within. This got me thinking about ‘place’ in terms of online education. Do students view an online class as a ‘place’? If they do, how can educators make an online space into a place for learning? Place in context of human geography has two elements—the physical characteristics of the natural environment and the human influences—ideas, interactions and interventions. There are several books on the concept of place including “Place: A Short Introduction” by Tim Cresswell, author and professor of human geography. Cresswell describes place not only as a location, but as a physical space where humans produce and consume meaning (2004). “Space and Place: The Perspective of Experience” by Yi-Fu Tuan, one of the first scholars in the discipline of human geography, describes place and space as a relationship, that includes the feelings and thoughts humans associate with each (2001). When examining face-to-face education settings we get a sense of how place influences learning. Inherent to education is the idea of going to a place to learn—a place to study, to meet with classmates, to lecture, to engage in discussion, to do research, etc. And a place’s physical aspects—the decor of a room, the temperature, WiFi availability, space constraints, available resources, even furniture, can influence students motivation, their effectiveness or even willingness to learning. As do the human aspects associated with a learning place—interactions, discussions, institutional processes, etc. In my experience it’s these human aspects that are most often associated with online education. Yet a sense of place that addresses the physical aspects in an online course is more elusive. Elusive—but necessary. Few resources exist for educators wanting to learn about place-making in an online class. The closest I’ve found is the Community of Inquiry (CoI) model; a framework for describing presence online. 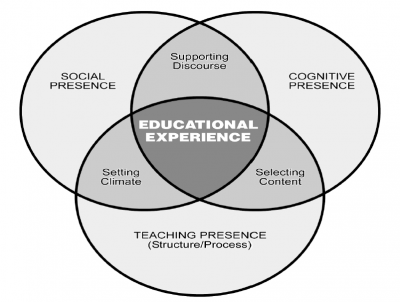 The CoI model encompasses three dimensions of presence for online learning spaces: teaching, social and cognitive presence. 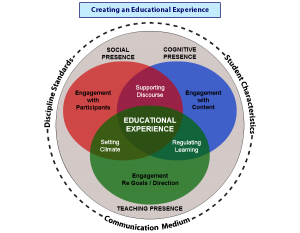 The model suggests that effective education experiences occur when the three dimensions coincide. This is a good starting point for place-making. It addresses the human aspect of place-making through the three dimensions. Yet as mentioned, addressing the physical dimensions of place-making online is more challenging. Effective use of Images and media can contribute to place-making. An experienced online educator Laura Gibbs (@onlinecrslady) maintains a dynamic course site for each of her online classes (Mythology and Folklore) using embedded images and content representing students’ course work from various digital platforms. Not only do students get to see their work featured on the course site, but the course becomes a dynamic space for learning. When students log-on to the course site, the most recent student assignment is featured (screenshot below), which students can access via an active link. Gibbs’ use of media tools (Rotate Content, inoreader widgets, etc.) and platforms (Twitter, Pinterest, Blogger) support place-making by creating a learning space that has meaning and purpose for students. Students shape the space by their contributions, interactions and involvement—making it a ‘place’ for their learning. Using Twitter as a tool to contribute to place-making in an online course. Screenshot of Tweet featured on one of Gibbs’ course sites. 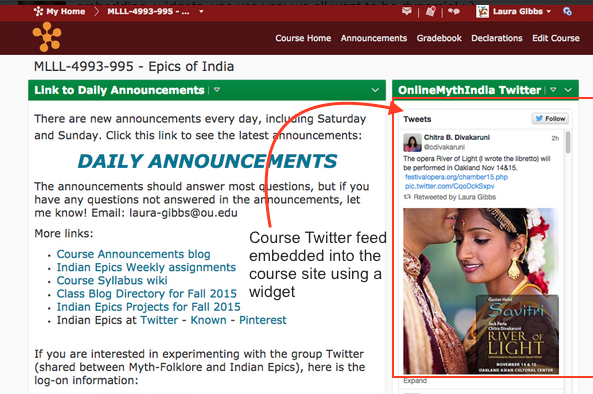 Gibbs posts Tweets featuring course updates, links to relevant resources; students also contribute. The idea of ‘place’ in online education is an interesting one; it’s another way thinking about and approaching online education. 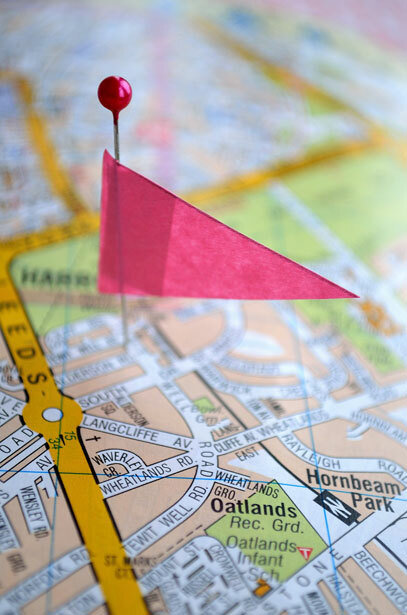 The idea of place-making in online courses could be one way to engage and motivate students, to make learning relevant, meaningful and effective in our digital world. If you have ideas for place-making in online courses, readers would be interested—please share! Cresswell, T. (2004). Place: A short introduction. Malden, MA: Blackwell Publishing. Robbins, P. (2014). The importance of place. Lecture presented in Understanding cultural and human geography. Chantilly, VA: The Great Courses. Tuan, Y. (2001). Space and place: The perspectives of experience. Minneapolis, MN. University of Minnesota Press. The idea of considering students’ emotions in context of online or blended learning may seem absurd. There are numerous factors instructors consider when teaching online that would seem to take priority over students’ emotional state. Yet a recently published paper “Measuring and Understanding Learner Emotions: Evidence and Prospects” reveals that feelings of learners—their emotions can impact learning in online and blended environments, specifically motivation, self-regulation and academic achievement (Rienties & Rivers, 2014). I share with readers in this post the concept of ’emotional presence’, what it means for instructors teaching online, and how instructors can address learners’ emotions in their online courses. The idea of emotional presence builds on the Community of Inquiry (CoI) model. The model provides educators and course designers with a framework to address factors unique to learning online within three dimensions: 1) social presence: where students project their personal characteristics within the online community that position them as ‘real’ people, 2) teaching presence: where the instructor directs the learning process such that students’ sense he or she is ‘there’, and 3) cognitive presence where learners construct meaning through sustained dialogue and communication. Developed by Garrison, Anderson and Archer, the CoI model continues to evolve and is the subject of several empirical studies (The Community of Inquiry, n.d.) The three dimensions are the focus of the framework, but the idea of learner emotions and the role they play in the online environment is not addressed. Until now. Recent papers and articles address how learners feelings impact their learning online. Emotional Presence is the outward expression of emotion, affect, and feeling by individuals and among individuals in a community of inquiry, as they relate to and interact with the learning technology, course content, students, and the instructor. One might wonder why even bother considering how students are feeling. More so in online environment where it seems impossible to address. Yet after reviewing the research there is evidence from a variety of sources that suggests emotions play a powerful role in learners’ engagement and achievement, and that the role of emotions in online learning deserves special consideration (Artino, 2012; Rienties & Rivers, 2014). In face-to-face (F2F) classes emotional presence happens seamlessly. Teachers detect emotional cues of students due to their physical proximity. I found several studies examining presence behaviors of teachers working with students in the classroom—a phenomenon labeled ‘instructor immediacy‘. Though it’s beyond the scope of the post to go deeper, several studies validate the importance of such cues and the role of emotions in facilitating learning (Andersen, 1979). If we apply these principles to learning environments without physical closeness, in an online course for instance, there needs to be a deliberate effort to include cues that support emotional presence. Cues visible in F2F settings include, smiling, making eye contact, knowing students by name, and demonstrating interest. In online classes, it’s easier-said-than-done. The technology and physical distance create a barrier that make is difficult for instructors to read and reach their students. There is no consensus in the research on best practices for addressing emotional presence in online classes effectively. But between the papers there are several suggestions which I summarized below. Synchronous discussions via chats or video conferences provide instructors opportunity to assess and read learners emotions that may impact their learning progress, such as uncertainty, confusion, even positive emotions, interest and enthusiasm. Analyzing written text and online discourse in discussion forums by looking for key words may provide insight into learners emotions. 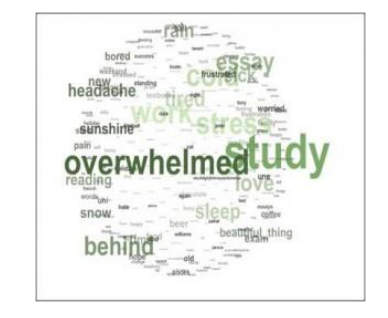 Such words as I feel “frustrated”, “overwhelmed”, “behind” are a few examples. Examining learners’ online behaviour in terms of the frequency of logging on, clicks and time spent on certain pages within the LMS (caution, this method provides a one-dimensional perspective and may only be useful when considering other factors). As online learning evolves and allows us to bring quality education to the learner, there are barriers to consider and overcome. Reading student cues and considering their feelings that may affect their progress is one area that we cannot ignore. It’s studies like those mentioned here that brings us closer to delivering personal, quality and meaningful learning to students. Andersen, J.F. (1979). Teacher immediacy as a predictor of teaching effectiveness. In D. Nimmo (Ed. ), Communication Yearbook, 3 (pp.543-559). New Brunswick, NJ: Transaction Books. Artino, Anthony R. (2012). “Emotions in online learning environments: Introduction to the special issue.” The Internet and Higher Education 15(3): (pp. 137-140). Rientes, B. R., & Rivers, B. A. (2014). Measuring and understanding learner emotions: Evidence and prospects (Review 1, pp. 1-16, Rep.). Learning Analytics Community Exchange. Presence is considered a central concept in online learning. ‘Presence’ in the online course is understood as the ability of people “to project their personal characteristics into the community, thereby presenting themselves to other participants as ‘real people’”. (Garrison, Anderson, & Archer, 2000, p. 89). 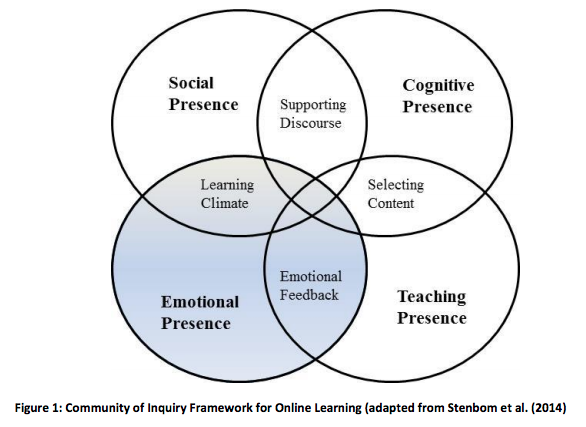 One way of examining ‘presence’ online is through the Community of Inquiry (CoI) framework, a frequently referenced model that outlines three interdependent dimensions of presence: social, teaching and cognitive. When all three elements interact, it’s then that students are able to experience deep and meaningful learning. CoI–is breaking through the social barriers that exist because of the transactional distance between students and instructors (Moore, 1993)…. These human qualities, established through personal sharing, help students develop a sense of trust in and connection with an instructor…foundational for cultivating the social presence needed for a healthy and productive [learning]. Other bodies of research suggest presence is a key factor to engagement, another metric for predicting student success in online coursework. Presence in this context also considers student perceptions of instructor involvement as a central factor. High levels of engagement, studies indicate, lead to higher levels of student achievement, greater likelihood of graduation, and deeper satisfaction (Oblinger, 2014, p 14). But describing presence in an online course is vague, slippery—hard to describe. It’s a challenge for instructors to figure out how to make presence happen. What does one do to create social and teaching presence in an online course? This post outlines examples that describe how faculty and instructors use social media to establish presence—that feeling of connectedness among students in online and F2F courses. What’s described here, social media as a vehicle for presence-development, is different however from using social media as a pedagogical tool, which I wrote about in a previous post, How to Use Social Media Platforms to Create Meaningful Learning Assignments. Though there is some overlap. One of the aims of using social media platforms in this context is to bridge the distance gap that exists in online education, to overcome the disconnectedness student can feel when studying online. Presence in F2F classes: Numerous educators have found that social media tools support a sense of community, or connectedness in face-to-face (F2F) courses as well. One faculty member shares his experience in the Prof Hacker column over at The Chronicle, “Twitter adds to the community spirit of the class and help to sustain student interest across the days and weeks of the semester” (Sample, 2010). Below are examples of how instructors use social media platforms to create a sense of being ‘there’. Note: the methods described here facilitate informal learning; to foster a learning community. Social media used in structured (or formal) learning activities is used as a method to bring about targeted learning outcomes as mentioned earlier. The paper “Tweeting the Night Away: Using Twitter to Enhance Social Presence” describes how the Twitter platform creates a sense of community among students. In 140 characters or less, learners share ideas and resources, ask and answer questions, collaborate on problems of practice, participate in discussions at conferences, webinars, or lectures. A hashtag (a.k.a.the pound sign ‘#’) for a class aggregates all ‘Tweets’ (messages) sent on platform when the hashtag is used as a tag for all class-related messages. For example a professor at Trinity College created a tag #eng685 for his face-to-face English class (Sample, 2010). Hashtags are also used to aggregate tweets on specific topics, e.g. #onlinelearning, #highered. 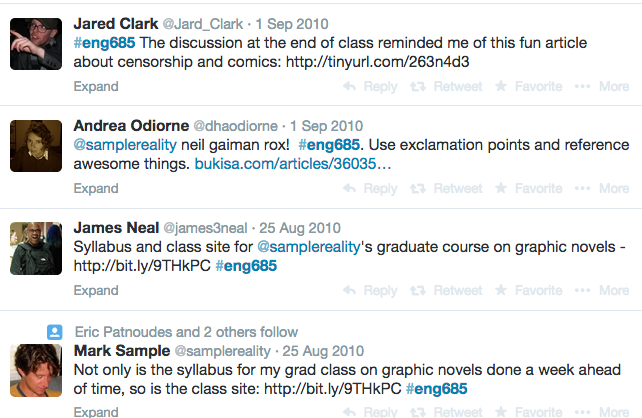 Professor Sample allows and encourages students to tweet during class, in an attempt to create a “back channel” to class discussion but admits, “This back channel idea has never worked as successfully for me in class as it has at an actual conference” (Sample, 2010). 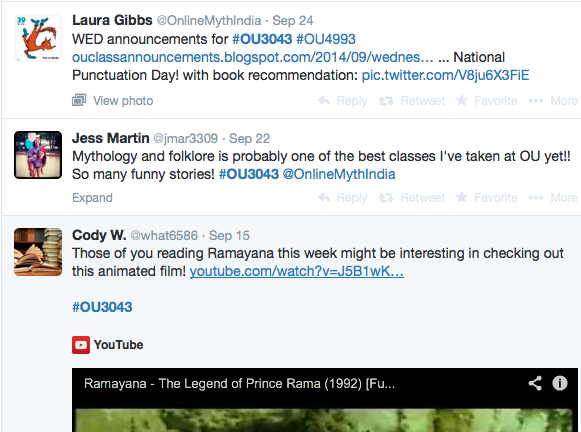 Screen shot of a current course, ‘Indian Epics’, #ou3043, an online course taught by Professor Gibbs at the University of Oklahoma. 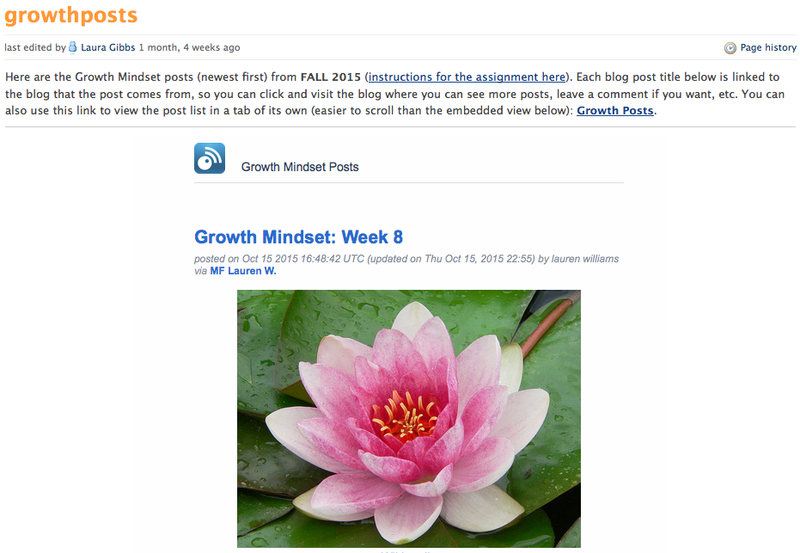 Gibbs shares links to students’ Pinterest boards on a webpage within the course site on the Pinterest Class Directory. 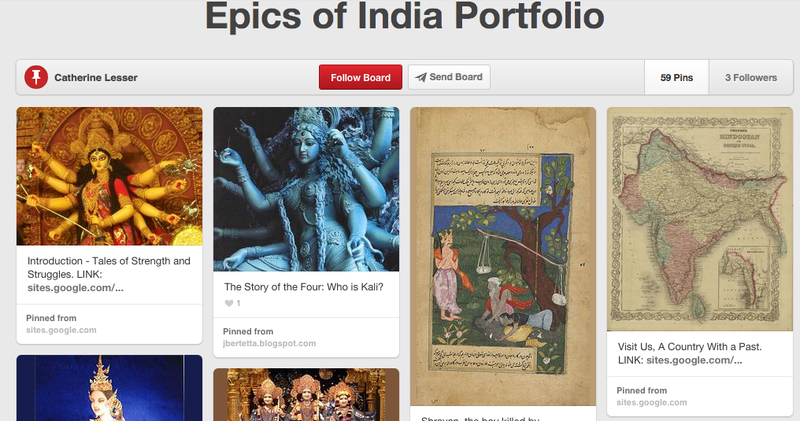 Students can comment on one another’s boards, re-pin to their own board and/or ‘like’ a pin. Students do need sign up for a Pinterest account using an email address. Real-time meetings, seminar discussions even watching panel discussions over video conferencing platforms are excellent methods to create a feeling being there and together. 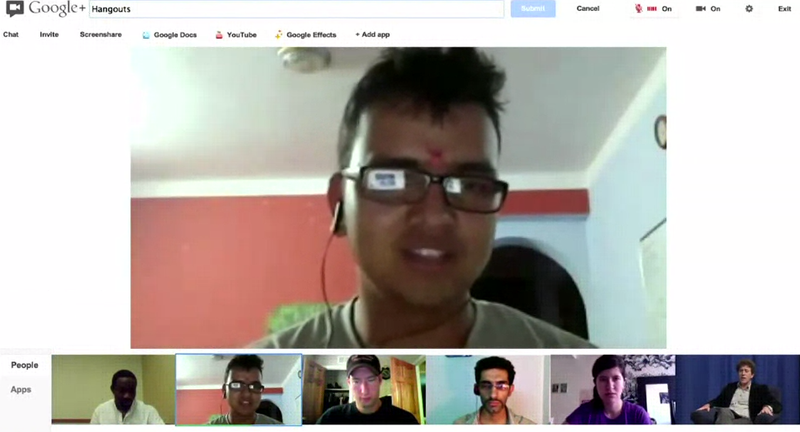 I’ve participated in several online courses (MOOCs & closed, small online courses) where the Google+ Hangout platform (or similar) has been used in a variety of ways that do create feeling of being in a learning community. Even if students can’t engage in the active discussion on the platform, Twitter is frequently used as the back channel for questions and discussion. Sessions are usually recorded, then posted for students that can’t participate live. Screen shot of Google Hangout of a seminar discussion around a class reading with five students and professor of a Massive Open Online Course. Other students’ watching live, asked questions and discussed via Twitter. Instagram is one of the most popular social media platforms used by high school and college students in North America. It’s similar to Twitter, as the platform uses hashtags, though it’s billed as a photo sharing platform. Yet it has more potential than Twitter since character limit for Instagram captions is 2200, considerably more than Twitter’s 140 limit. Instagram comments have a limit of 240 characters. I’ve not yet come across examples of educators using Instagram to create social presence for courses, though numerous institutions use Instagram as a marketing vehicle. There is considerable potential in online courses for Instagram as a presence-building tool given its popularity with the younger set—it’s just a matter of time. Technology is shaping culture. Alternatively, one could say that culture is shaping technology. Whichever viewpoint one takes, social media is central to the change, to the shift in how we communicate, socialize and learn. Educators have an opportunity to help students (and ourselves) blur the lines between informal and formal learning—creating life-long learners. Garrison, D. R., Anderson, T., & Archer, W. (2000). Critical inquiry in a text-based environment: Computer conferencing in higher education model. The Internet and Higher Education, 2(2-3), 87-105. Liu, S.Y, Gomez, J. & Leng, C. (2009). Community College Online Course Retention and File Grade: Predictability of Social Presence, Journal of Interactive Online Learning, vol. 8, no 2. What are the effects of benign, inappropriate or even toxic student-to-student or student-to-instructor exchanges in online learning communities? How do such exchanges affect learning outcomes? It’s a topic that’s had little attention from researchers and educators, but as learning continues to scale-up with online and open communities educators need to be paying attention, examining and addressing such interactions. This post shares highlights from a recent paper, “Would you ever say that to me in class?”: Exploring the Implications of Disinhibition for Relationality in Online Teaching and Learning. When reading the paper “Would you ever say that to me in class?”, I considered my experiences as an online student—having more than one exchange, though not toxic, that were strong enough to leave a sting—dampening my enthusiasm for engaging and participating with my classmates. I’ve since worked with students and faculty that have experienced similar exchanges. Though not all reach the toxic level, there have been instances where faculty encountered students using strong and offensive language, requiring the removal of offensive posts within discussion forums and other actions. Lack of civility in online forums within learning communities is manageable in small, closed online learning communities where an instructor is in control of a class of up to thirty, or even forty students. However, as classes expand, with MOOCs, and other types of learning communities growing, in combination with platforms that allow anonymity (such as Coursera) it will become an issue for educators [and their institutions] involved in online learning at some time or another. Peers within my network have shared their experiences as students and instructors within MOOCs that involve politically charged or contentious subject matters where discussion forums are fraught with offensive, even toxic comments and vitriol discussion. It is for this reason that I write this post; to provoke thought and discussion in order for educators to be proactive and develop appropriate strategies. More so because online behavior in learning communities is complex. On one hand, a sense of presence, or “being there” is critical to deep and meaningful learning and thus needs to be encouraged. 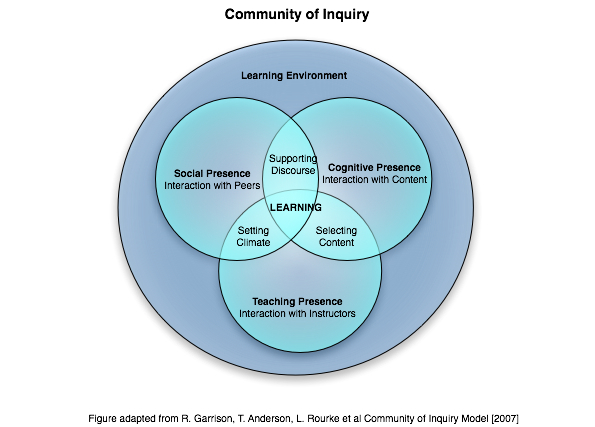 The Community of Inquiry (CoI) is a well-researched framework (Garrison, 2007) that addresses three dimensions of presence—social, instructor and cognitive that are deemed necessary for higher education students to experience deep learning in online environments. Yet on the other, the CoI framework, due to its two-dimensional nature, does not give us insight into the type of exchanges, the tone behind the student-to-student exchanges online and how they might affect learning. Just as tone of voice, eye contact and body language affect verbal communication—word choice, characters used, even font size and type, (e.g. CAPITAL LETTERS), in text exchanges affect meaning of a message conveyed in an online space. Yet some students will exhibit online disinhibition, emboldened by lack of personal contact, distance and in some cases anonymity. Such behavior can wreak havoc within a learning community—can discourage participants, damage student confidence, stall, or impede learning. In open learning situations that are not controlled by any one individual due to a connectivist learning approach or student-centered focus for example, dealing with such behavior is challenging, though not impossible. Swift and deliberate action is required by one or more individuals. Even in controlled settings, on a closed platform, or within a small learning community, action is required to preserve a learning climate and community. The study is qualitative in nature. Analysis of data collected from two universities, from undergraduate and graduate students revealed “instructors’ and students’ experiences of connection with, or disconnection from, each other were profoundly influenced by the phenomenon of online disinhibition. In most of the students’ stories, arguments and disruptive behaviour were seen as the direct result of the kinds of miscommunications that occur in online environments, where paralinguistic cues such as facial expressions and tone of voice are not available to clarify meaning. Online disinhibition is also associated with positive outcomes— In some cases, the student-to-student or student-to-instructor relationship may be enriched—for example, when a student shares an experience that personalizes and thus deepens the learning for everyone, or when a shy student opens up. In other cases, the relationship may be inevitably damaged, as when a student confides something she or he later regrets, or says something that other students consider inappropriate or offensive. 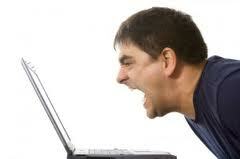 Online disinhibition is a phenomenon that affects not only learning exchanges in online communities, but social (e.g. Twitter) and gaming platforms, etc. Yet learning environments need a special layer of protection that goes beyond a ‘report abuse’ option that exists within most online platforms, e.g. Facebook and Twitter. Learning in online communities requires a level of trust, familiarity, and has associated with it an expectation of a ‘safe’ zone. How can educators create a safe learning community in a closed, online class? What about in an open learning community, in a MOOC? Answers to questions like these depend upon the learning community, the participants, the purpose of the learning and other factors. But it is up to us as educators to look for answers; we need to have strategies and built-in mechanisms within the different types of online learning communities that will provide [albeit wide] guard rails to foster, yet protect a climate of learning and development. I’ll be writing more about this topic, specifically anonymity in online learning communities. Stay tuned! Garrison, D. R. (2007). Online community of inquiry review: Social, cognitive, and teaching presence issues. Journal of Asynchronous Learning Networks, 11(1), 61-72. Rose, E. (2014). Would you ever say that to me in class?”: Exploring the Implications of Disinhibition for Relationality in Online Teaching and Learning. Proceedings of the 9th International Conference on Networked Learning 2014, Edited by: Bayne S, Jones C, de Laat M, Ryberg T & Sinclair C.
This article examines the potential of synchronous communication in online education by analyzing the newest tools and platforms that facilitate real-time group communication, and the pedagogy associated with implementing synchronous communication tools into asynchronous learning environments. Communicating in real-time from a distance has never been easier. There are numerous new platforms and applications (apps) available free-of-charge that are easy-to-use and facilitate seamless communication between geographically distant people with access to a smart phone or laptop. After reading a WSJ article reviewing several smart phone apps that facilitate real-time communication among small groups seamlessly, I realize that the time is coming where synchronous tools will bring online education to the next level. Over the last two years there’s been a flood of free apps and platforms on the market that break down distance barriers and allow people to communicate from their handheld mobile device, tablet or laptop. One example is group video conferencing. 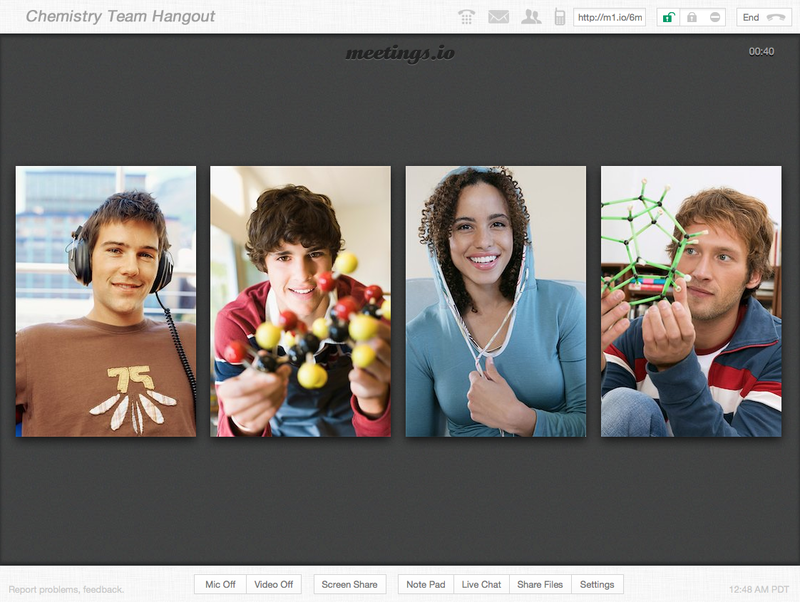 There are now several free web-conferencing tools for groups that also feature document and screen sharing, including Google Hangouts, newly launched appear.in (video conversations for up to 8 people), and meetings.io (also free). These platforms knock down the once insurmountable barriers for video conferencing use in education—barriers of student access, and technology that was cumbersome and expensive. However, one significant barrier still exists when considering synchronous tools for education settings, and that is pedagogy. From the same paper as the above paragraph, is this statement that describes the barrier crisply, “from a practitioners point-of-view, the challenge will come from the need to be flexible, adaptive and innovative. In other words, the need is to rapidly develop new understandings of pedagogies to best utilize the person-to-person interactivity of emerging technologies” (Andrews et al, 2010). These apps and platforms hold great potential for online education—seamless real-time chats, video discussions that can facilitate peer-to-peer, and educator-to-student(s) exchanges that foster social connections, learning support, feedback or create a space for discussion of concepts and ideas in a way the asynchronous communication cannot. The new technology brings with it numerous possibilities. But though the potential is great, so are the challenges associated with implementation. As with any educational technology tool, the purpose for using the tool has to make sense, has to fit in with the curriculum in a pedagogically sound way that supports learning and achievement of the course objectives. Before getting to highlights of the research addressing synchronous tools in online education, I’ll emphasize what needs to happen prior to implementing educational technology into a learning environment, which essentially is a needs analysis. The first step is asking questions—questions such as, “what educational problem are we trying to solve?→ what method can we apply that supports the problem?→ what tool will best work for the application that works within the learning context?“. It’s the answers to these questions that guide the learning design process. The next steps are when the real work of course design begins, developing the learning strategy to meet learning objectives ideally by following a model of learning or instructional design [I write extensively about instructional design. A good post for readers interested in learning more about instructional design is “Start Here”: Instructional Design Models for Online Courses]. Synchronous tools are not a given for each online course, it will depend upon a number of factors as determined during the course design process. Though to give readers an idea of the types of situations where synchronous tools may be used, I’ve included excerpts from Kansas State University’s webpage ‘synchronous course delivery‘ from its e-learning faculty modules site. Note, that it’s not always the instructor that will use synchronous tools, but learning counselors, tutors, small groups of students and others. “Online real-time may be used for a number of learning purposes. There may be a small window of time when an online class may access a digital lab; a simulation; …an interactive streamed event. ….to introduce learners starting a cohort-based program. … there may be icebreakers to help people connect online…. …for academic and professional advising and counseling. It may be used for group or expert critiques of student designs and e-portfolios. ….for student group work, collaborations, and study sessions. Learners may interact with each other for problem-solving, planning, co-design, or strategy sessions. One of the papers I review here from the International Journal of Education Technology, provides sound advice based upon the research, and one worthy of highlighting is that synchronous tools should not be used as a one-way medium, a format where the instructor can deliver information in real-time, but instead be viewed as a vehicle that allows for the exchange of information, for accommodating three or four-way [or more] conversations that build learning, ideas and learners’ motivation. The synchronous communication medium should be reserved only for exchanges that support a course objective or other learning-related function that can’t be accomplished through asynchronous methods. Below are a selection of highlights from the papers referenced in this post that outline the impact of, and considerations for synchronous methods used in online education. 1) Building Social and Teacher Presence: More than one study suggests that synchronous communication activities support the social needs of online students not typically met in the asynchronous format, “Social support is desirable as a way to foster knowledge work and collaborative learning; it provides an environment where communication is encouraged; e.g., anecdotes and personal experiences encourage trust, which foster receptive and creative learning environment” (Hranstinski, 2008). Synchronous activities contribute to building of social presence, one of the three dimensions of the Community of Inquiry (CoI) framework, a frequently referenced model that describes the conditions for optimal online learning experience (Garrison, Anderson, & Archer, 2000). When the three dimensions are present, teacher presence, social presence and cognitive presence, the student can experience deep and meaningful learning. Purposefully developed synchronous [and asynchronous] activities can contribute to building social and teaching presence as supported by the research cited here. 2) Group Size: The purpose of a group activity as determined by the course design process, will determine the appropriate group size as well as the best tool or platform to support it. Video and hangout platforms each have a limit to the number of individuals participating at once, as do chat platforms, which again reinforces why the instructional strategy created in the course design process is critical. The meetings.io platform for instance allows up to five people per hangout, ideal for a small group discussion, while Google Hangout accommodates up to ten, which may be applicable for a meet-and-greet type session held at the beginning of a course. 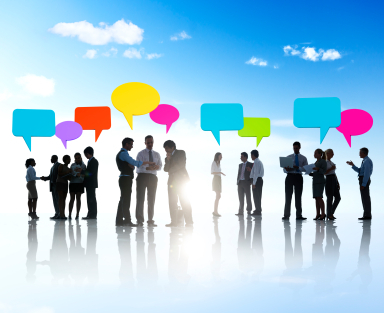 Chat platforms, for example whatsapp, might be used effectively for group discussions, i.e. one question related to a course topic, where students contribute initial thoughts and exchange ideas, followed by an asynchronous forum discussion continuing the conversation. 3) Differences in Time Zones: One of the drawbacks of synchronous tools often cited is students living in different time zones, however in closed online courses for credit, this is not as much of an issue as massive courses that cater to a world-wide audience (though even in these instances, there are ways to accommodate learners in different time zones). In my personal experience with synchronous activities in closed, online classes, most students are willing to adjust their schedule to participate in synchronous activities, more so when activities have a clear purpose and appear worthy of students time. 4 ) Instructor and Student Familiarity with Tool: As with any technology used in online education, familiarity with the technology is essential to establish the foundation for a successful learning outcome. The institution is responsible for providing professional development for faculty and instructors, and working with course designers/instructors to build-in course time for student practice with the tool, and make available resources that support students (and faculty) with the technological issues. Garrison, D. R., Anderson, T., & Archer, W. (2000). Critical inquiry in a text-based environment: Computer conferencing in higher education model.The Internet and Higher Education, 2(2-3), 87-105. In last week’s post Tools-of-the-Trade to Make your Online Teaching Even Better I reviewed various tools that help online educators make a connection with students by using media other than text to deliver guidance and instructions to students in online classes. In this post I focus on how educators teaching online [and face-to-face] can use ed-tech tools effectively to provide formative and summative feedback to their students. I’ve included several resources and examples of ed-tech tools in this post in a case study format featuring both online and face-to-face educators describing their methods. Formative feedback in some cases is more valuable to student learning than the final assessment. For instance, when a final grade comes later in the course session the student is not as receptive to feedback, and often focuses on the grade not the feedback. Formative input on the other hand allows instructors to promote deeper learning by prompting students to dig deeper and expand and clarify their argument or position while the student in engaged in the learning process. Instructors that foster depth of learning with this kind of real-time feedback, push their students to dig deeper and think more critically. Below is a selection of excellent and user-friendly ed-tech tools that allow educators to give this kind of input seamlessly. Tools to use for Audio Feedback: Many LMS platforms have built-in audio tools, Canvas does as does Desire2Learn. There are also several Apps available for Mac and Android systems that facilitate audio feedback, though Vocaroo seem to be the most highly rated audio app for its simplicity. I like the audio record feature in Evernote. It allows you to record easily, and then email the voice recording in a note format in a snap. Case Study #2 Feedback [formative and summative] via Screen Casts. 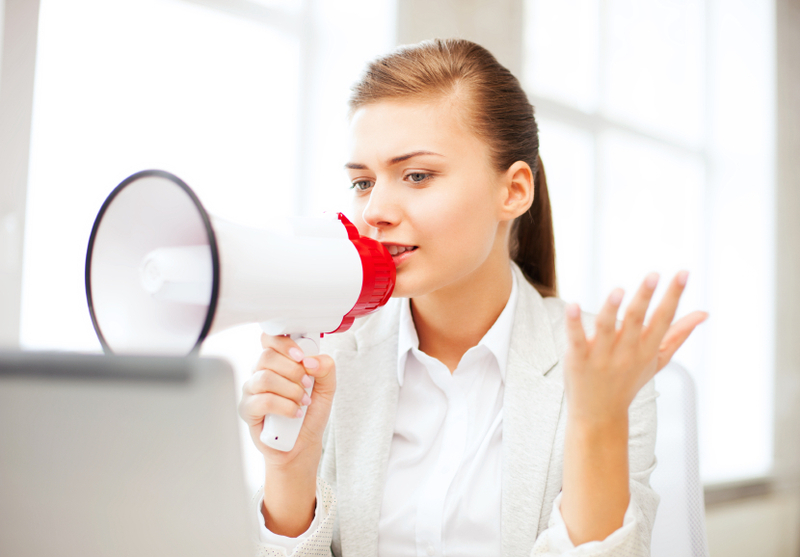 Screencasts allow an instructor to talk through a student’s work by recording audio comments on the student’s assignment displayed on the instructor’s screen. Below is an example of screen cast where an instructor provides formative feedback to a student on her essay using the free program for screencasts, Jing [screen casts are also used frequently for summative feedback on individual and group assignments]. With this method, the focus is on the students’ work which is featured on the screen—either a document file that has been downloaded onto the instructor’s computer and is opened, or any resource online—Google document, e-portfolio item, etc. It is best not to sound too formal in screencasts—speaking naturally as you would to a student face-to-face feels more authentic to students. The resource below is on the platform Screencast.com (associated with Jing, both are by the company TechSmith), and which is free as well. In this instance the professor made this available as a public file, though one can make it private for only those with the link able to view it [a unique link (URL) is created for each screen cast when uploaded to Screencast.com. This functionality is built into the Jing program]. The Center for Writing at the University of Michigan, provides an excellent resource in PDF format Giving Feedback on Student Writing. The screen cast below is drawn from this resource. Click the image to view a screen cast recording of an instructor giving formative feedback to a student on her essay. Thanks to University of Michigan’s Writing Center for making this example available. Case Study #3: Formative Feedback using Google Drive. A literature professor teaching face-to-face classes at Santa Clara University uses Google Drive (the new term for Google Docs) with his students to provide feedback on the draft copy of students essays. How it works: The student creates his or her essay in Google Drive, enables the sharing feature and includes the professor’s email address which sends the link to the prof. The professor then makes comments, notes on each student’s draft document [Google drive provides excellent tools for providing comments in the side bar and/or making comments within the document itself] and the student is automatically notified of the comments made. If there are methods for giving student feedback that you would like to share with readers, please do so by posting a comment. Other readers benefit greatly with the exchange and sharing of ideas. Thanks!